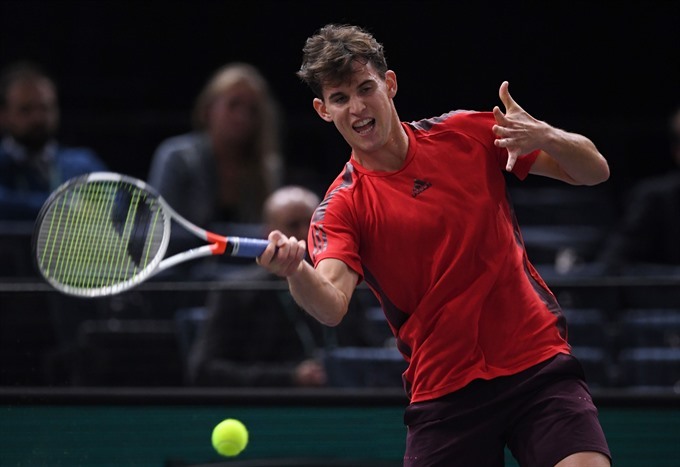 PARIS — Austrian fifth seed Dominic Thiem battled into the last 16 of the Paris Masters on Tuesday with a 6-4, 6-7 (3/7), 6-4 victory over German lucky loser Peter Gojowczyk. The 24-year-old Thiem, who has reached the French Open semi-finals in each of the last two years, was made to work hard in the capital before eventually setting up a third-round tie with either Fernando Verdasco or Kevin Anderson. In a tight opening set, Thiem grabbed the only break in game five, having earlier seen two opportunities pass by. Gojowczyk battled hard in the second set, but the match appeared to be over when world number six Thiem broke in the 11th game. The plucky German had other ideas, though, as he broke back before storming through the resulting tie-break to force a deciding set. Neither player managed to even create a break-point chance for the first nine games of the third, but Thiem moved through the gears at the crucial moment to claim the win with four straight points on the Gojowczyk serve. US Open semi-finalist Pablo Carreno Busta slumped to a 6-4, 6-1 defeat by home wildcard Nicolas Mahut to leave his World Tour Finals hopes in the balance. The Spaniard currently holds the eighth and last spot for the year-ending event in London, but his loss gives added hope to the likes of Anderson and Juan Martin del Potro, among others. Argentinian Del Potro takes on Joao Sousa in his opening second-round clash on Wednesday, with the former US Open champion needing to reach his fifth successive semi-final to overhaul Carreno Busta. South African Anderson, who was beaten in the final by Rafael Nadal at Flushing Meadows, needs a run to at least the quarter-finals to keep his hopes alive. But Sam Querrey’s Tour Finals bid is over, after the big-serving American suffered a 6-4, 6-4 loss to Serbian qualifier Filip Krajinovic. Querrey will end a successful season in which he reached the Wimbledon semi-finals just outside the world’s top 10.